Retired Simpson University music professor Lois Nichols recently participated in a world record-breaking gathering of 664 handbell musicians. “It was quite a grand experience to participate in the Guinness Book of World Records attempt for most handbells ringing at one time,” she said. The event took place in November 2016 at the Mall of America in Minneapolis, Minn., and was a collaborative effort between the Salvation Army and the Handbell Musicians of American, a national organization of which Nichols is a member. The previous handbell choir record, set in 2013 in Japan, comprised 530 musicians. People from all over the U.S. played a medley of Silver Bells and Carol of the Bells. Nichols, her husband, Tim, and Lyle Hurley from the Redding Bell Pepper handbell group participated. They agreed to memorize the music and were each assigned two to three parts to play. “We got to talk to some of the other ringers, which was fun,” she said. In order to break the world record, judges were present to make sure all the participants were playing and the performance lasted at least five to six minutes. View a video of the performance here. Top: This is a view from the floor of the mall as the Nichols and hundreds of other musicians prepare to break the world record. 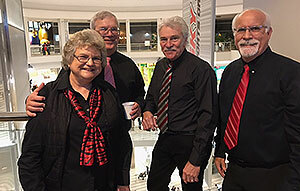 From left, Lois and Tim Nichols, Hart Morris (arranger/composer), and Lyle Hurley wait on the fourth floor of the Mall of America in Minneapolis to get lined up to play handbells for a world record.